This photograph is of the entrance to the Parlor Room of a hotel suite. The left pier cabinet is functionally a closet and drawer combination. 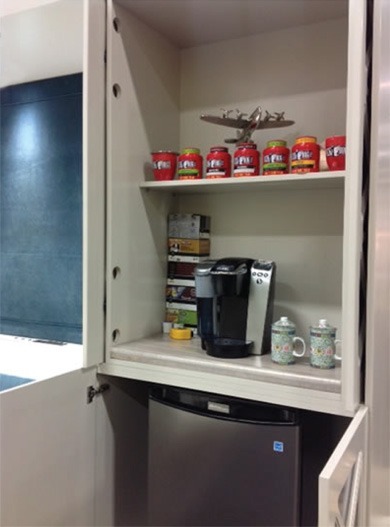 The right pier cabinet has a coffee station above the refrigerator. Between the two side modules is the SICO Room Maker King System. 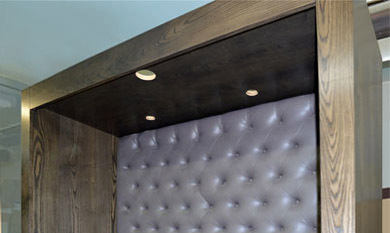 This Hotel Murphy Bed system’s headboard was upholstered in a velveteen fabric. The system also features our exclusive Dropped Deck that functions as a nightstand. Light controls are conveniently located on the Dropped Deck. 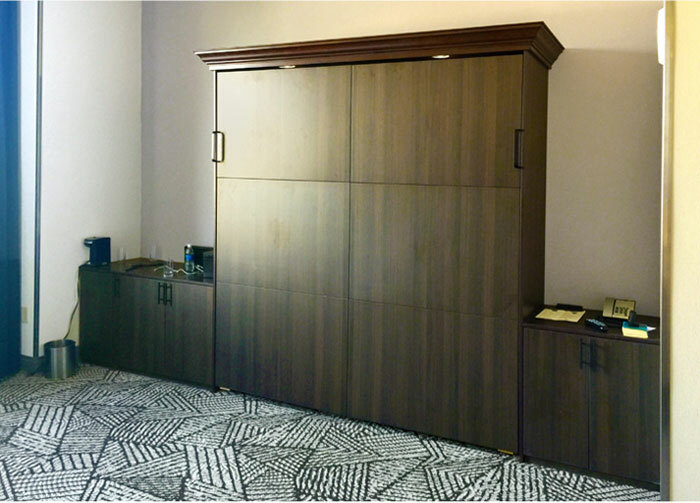 In the right photo above we see three distinctive parts of our SICO Room Maker system: the custom-made platform complements the design theme, and the tubular steel frame is arc-welded to become the world’s strongest Murphy Bed. The mattress can be any manufacturer. 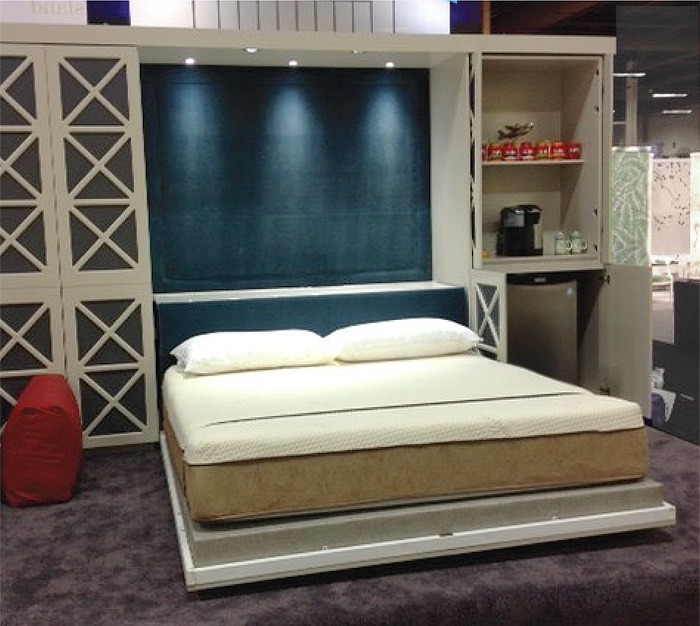 We took this bed to the Las Vegas Hospitality Design Expo in 2014, along with one of our Sofa Beds. This was the first year that we went to this premier hospitality design show. The Mandalay Bay Convention Center had over 900 exhibitors in this same hall. More than 9,000 owners and representatives of hotels attended this specialty showing of the most innovative products for the hospitality trade. 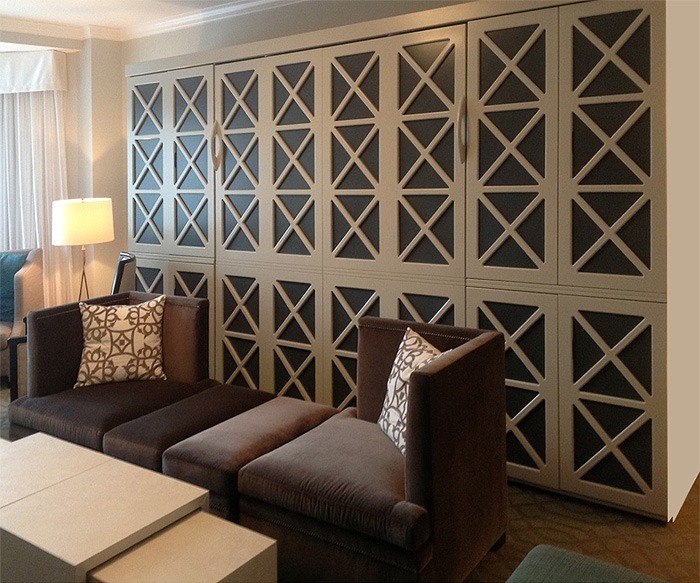 A large number of people requested our follow-up with specific custom design themes for their property. Please allow me to extend an invitation to Contact Me for a full explanation of the systems shown here and the possibility of designing a custom FlyingBed for your property. 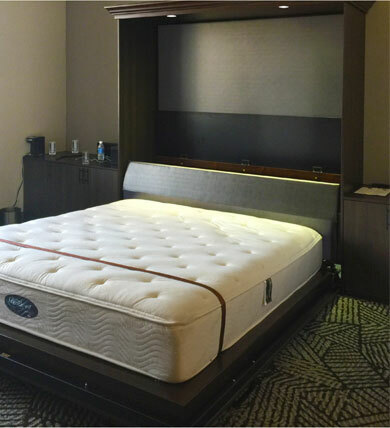 All of our Hotel Murphy Beds are designed to be stored with bedding & pillows in place. You can’t expect the guest to go looking in the closet for their pillow! The light system functions three ways. The back three fixtures are for accent lighting, and the two forward-tilt HERA® cold LED lights are individually controlled for reading. 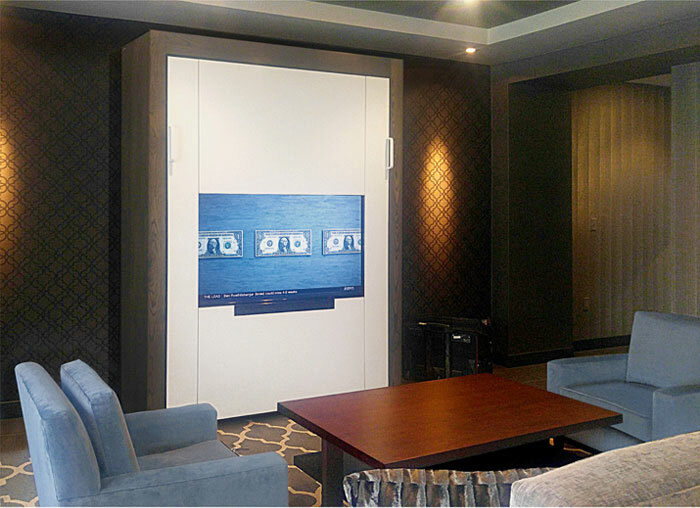 The SICO Room Maker King size hotel Murphy bed can be lowered and raised with one hand. 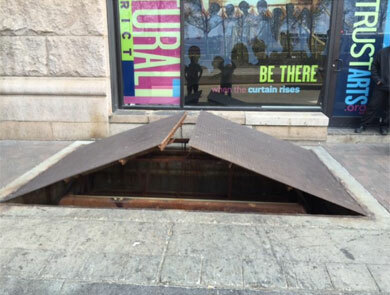 This photo demonstrates the ability of this superior system to hold all positions of movement, whether up or down. Here you can see the Coffee Station and mini fridge. 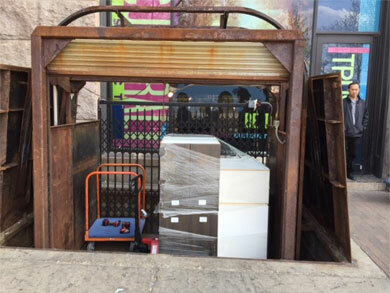 Conveniently stored out of sight. 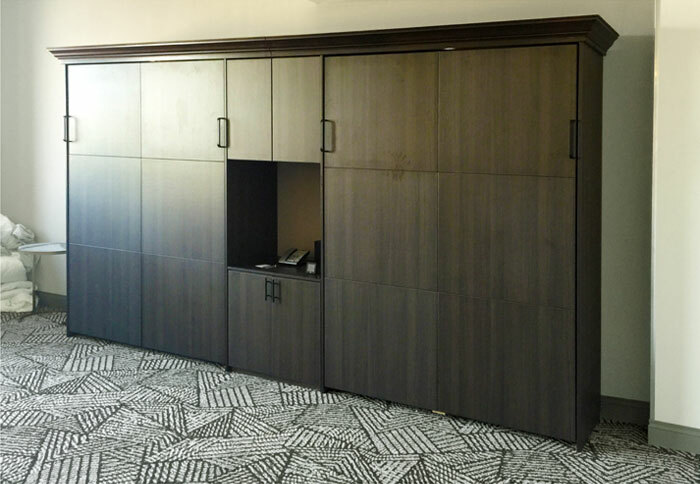 One of our most exciting projects to date, the brand new Guest House at Graceland™ called on Flying Beds to provide a queen hotel murphy bed for a meeting room suite. 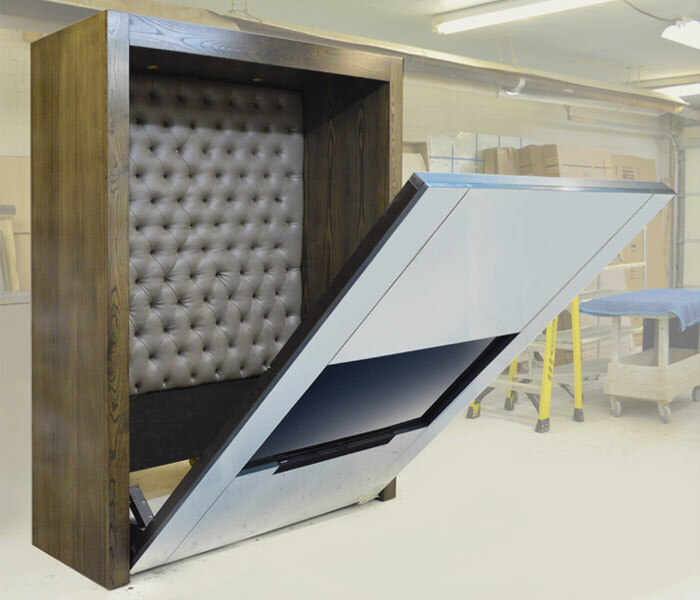 This is one of our signature TV Murphy Beds, perfect for business presentations. True to Elvis Presley’s distinct style, it features a glossy white bed face and a stained Ash wood surround. Inside, a pair of hi-lo LED lights accent the tufted-upholstered back panel, while a separately-controlled six-bulb cold LED light fixture from HERA® makes for comfortable reading in bed. Not visible in these photos are the SICO Room Maker mechanism, our innovative Dropped Deck nightstand option, and a handy electrical outlet with prong and USB ports for charging all your guests’ devices. 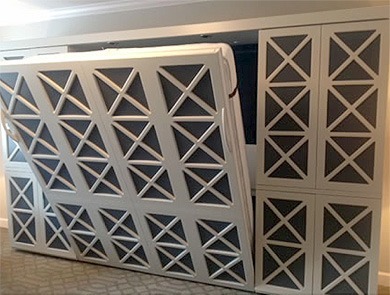 This luxury hotel murphy bed truly is worthy of the King. 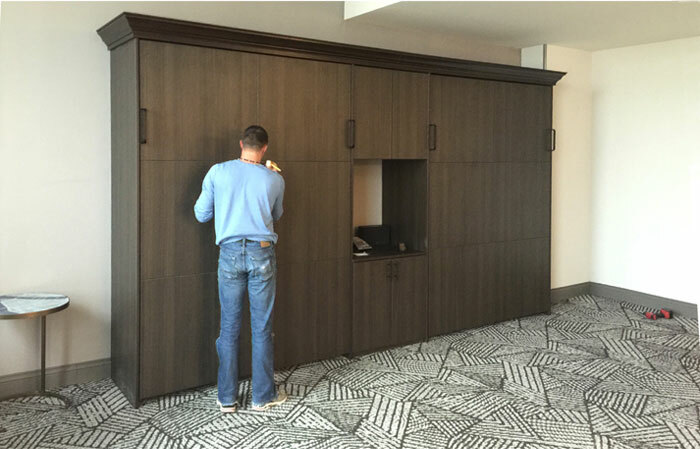 During the Summer of 2016, we installed 10 hotel murphy beds in this historic building in downtown Pittsburgh. What a grand building! Built in 1906 as a tribute to Robert Fulton, the engineer that designed the New Orleans steamboat. 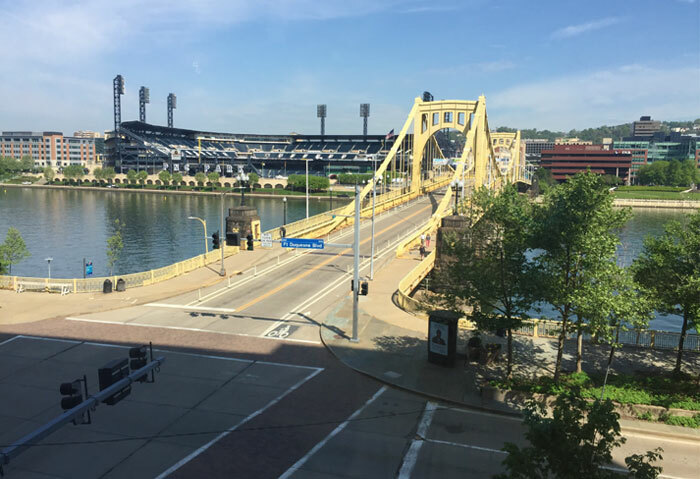 An added benefit, most of the hotel murphy bed rooms had a view of the famous bridges of Pittsburgh. Did you know this city has over 400 bridges?! Here is the Roberto Clemente steel bridge looking straight into the Pirates ball field. 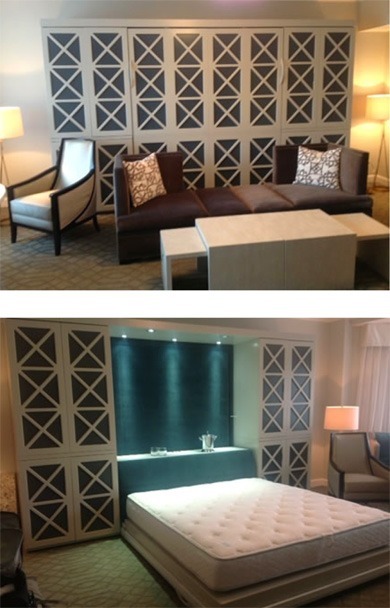 In all 10 hotel murphy beds, we installed King or Queen SICO Room Maker systems with a Wilson Art laminate surface. Prior to its renovation in 2001 to become the Renaissance Pittsburgh Hotel, it has a colorful history of being a VA hospital during WWII, and a robust nightclub with dance hall. Most interesting is the method of freight arrival. 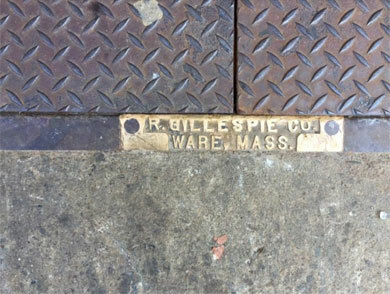 There is an elevator in the sidewalk that is the original Gillespie from Ware, Massachusetts. This company is still making custom elevators. http://gillespiecorp.com/The design firm wanted to make the meeting rooms on the third floor have ‘break-out’ rooms in the hotel rooms on that same floor. Clever idea to make the rooms dual-purpose. The guests holding a wedding or convention at this grand hotel will welcome the chance to have their room just ‘next door’ on the same floor! The hotel spec’d their choice of bedding from Simmons. Our exclusive Dropped Deck in each room made a giant nightstand surface. 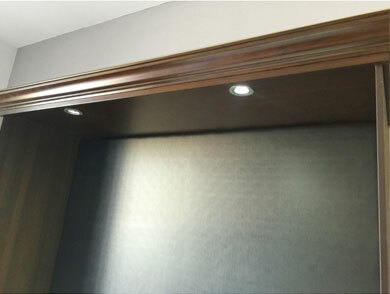 The interior cold LED lights from HERA® were a hit with the hotel staff.